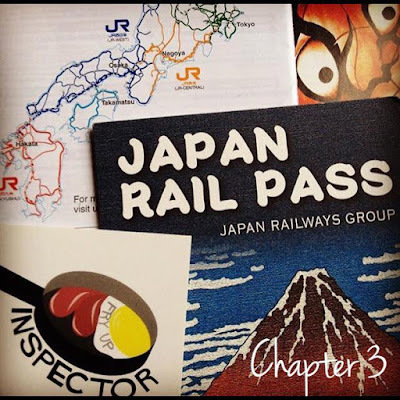 The Fry up Inspector: The Japanese Food Adventure Chapter 3 - Days 1 & 2. Back in Japan again! The Japanese Food Adventure Chapter 3 - Days 1 & 2. Back in Japan again! Back in 2014 my wife and I visited Japan and explored Tokyo, Kyoto, Nara and Osaka (read about that trip here). Japan was so incredible we felt compelled to return again in 2016, this time exploring Hiroshima, Nagoya and Nagasaki (read about Chapter 2 here). Once Chapter 2 had ended we felt an uncontrollable urge to return once again so started saving as much as we could so we could return to Japan the following year in 2017. 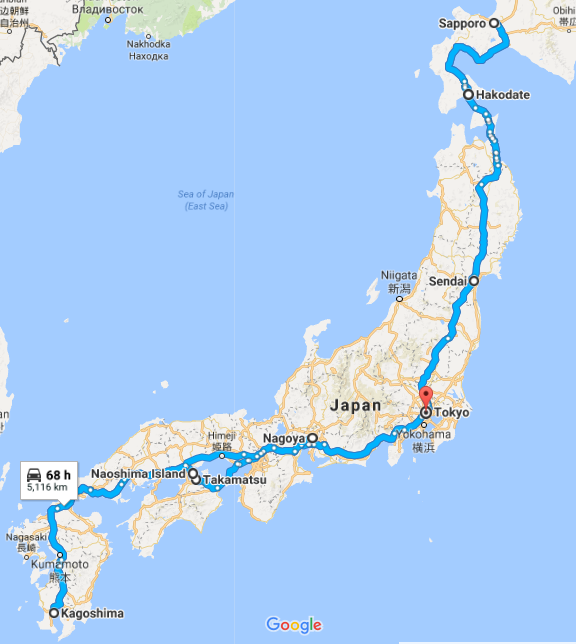 After months of planning the itinerary finally came together, we would start our trip in Tokyo and then head North to Hokkaido taking in Hakodate and Sapporo. Then we would head down the East coast to Sendai, this would be the perfect base to explore Tashirojima (Cat Island). From Sendai we would head down South to Kagoshima stopping at Takamatsu and Naoshima on the way. Finally we planned on returning to Tokyo via Nagoya where we would finally get to stay in a Ryokan. Flights, hotels, Japan Rail passes and admission tickets were all booked, what could possibly go wrong!? A couple of days before we were due to arrive in Tokyo Typhoon Talim had already reached Japan's Southern Island of Kyushu. I watched it's progress and realised it would hit Tokyo about 12 hours after we arrived. When checking in online with KLM there was the option to rebook our flights as possible cancellations could occur due to the Typhoon. I was getting quite stressed at this point but the flight was still scheduled on the website so I kept my fingers crossed. Just before going to bed we watched the news and noticed that North Korea had just fired another missile over Hokkaido were we were about to visit. This put a bit of a grey cloud over the trip but we were determined to get to Japan and begin our adventure. The following morning we made our way to Norwich Airport and both flights were still scheduled so things were looking up. Our flights this time were slightly cheaper than we paid last year, return flights from Norwich to Tokyo (via Amsterdam) cost us £764 each. Eating breakfast at Cafe Oasis in Norwich Airport was pretty disappointing but it passed some time before our flight. This breakfast cost me about £12 with half a mug of coffee, they appeared to be cooking eggs to order now which was a step in the right direction. With no eggs on display I forgot to ask for them when choosing my items, not the end of the world though as we were off to Japan! In the past year KLM have introduced a new system where you must now pay extra to choose your seats when booking. The alternative option is to check in 30 hours before the flight and hope your allocated seat is next to the person you're travelling with. We took the risk and managed to sit together on all flights so nice one KLM for not going all Ryanair on us. We took off from Norwich for the short flight to Amsterdam through drizzle and grey clouds, there was a rainbow though! Once at Amsterdam Airport we were delighted to see the flight to Tokyo was still scheduled. With Typhoon Talim not posing a risk to our plans we celebrated with a Heineken. In the UK I'm not a huge fan of Heineken but in it's homeland it tasted superb. We were keen to see some bands play in Tokyo on our first night there. We would arrive in Tokyo at about 8am (midnight GMT) so sleeping on the plane would be ideal if we could manage it. Whilst my wife enjoyed a beer I opted for red wine, my mind was firmly on what food was going to be served. As always I spent most of the flight following the plane on the map. On an 11.5 hour flight the food arriving is generally the highlight, It was far from exciting but I quite enjoyed it. The flight seemed to take forever and I didn't manage to get any sleep. We were finally in Japan again! We exchanged our Japan Rail order for a 21 day Japan Rail Pass and reserved some seats on the Narita Express bound for Shinjuku. A 21 day Japan Rail Pass cost us £382 each, slightly more expensive than last time due to a weaker pound. We grabbed some drinks and onigiri for the journey. Onigiri are rice triangles with a filling in the centre, they're wrapped in nori seaweed, taste delicious and cost around ¥120 (80p) each. There's an art to opening them though and on this occasion I didn't manage it. Tonight we would be staying in Shinjuku at Hotel Empire, a double room here cost us ¥7300 (£50) for one night. We arrived here at midday in desperate need of some sleep but check in wasn't until 4pm. We know from past experiences that being early in Japan isn't a good plan. We asked if we could check in earlier, sadly the answer was no though so we would need to come back in four hours time. The hotel did kindly offer to look after our cases until check in time though which was a bonus as it was pouring down with rain. Armed with brollies and incredibly tired we caught the train to Harajuku, the sea of umbrellas and busy Sunday afternoon crowds were way too much though. We headed off into the back streets and found a coffee shop, this cup of coffee was just the ticket which gave us a much needed boost. We ended up inside one of the many Yakitori grills found within Memory Lane. It was tiny inside but at least we were out of the rain for a while and could enjoy some food. To be perfectly honest Memory Lane is a magnet for tourists and with this in mind expect to pay a cover charge. The cover charge here was ¥300 (£2) per person, you did get a tiny and delicious starter included in the cover charge though. Drinking alcohol on no sleep probably wasn't the wisest plan, plum wine in Japan is so good though we threw caution to the wind and ordered some on the rocks. I couldn't decide what meats to choose so went for a mixed set costing ¥1000 (£6.75). It included pork, chicken, chicken liver, leek, chicken skin and mushroom. All grilled over a charcoal fire and coated in a sweet, soy based sauce, delicious! My wife knew from previous visits to Japan how difficult it can be being Vegan or Vegetarian. You can see from this menu just how confusing it can get. She managed to order some tofu though which she thoroughly enjoyed. She also ordered some mushrooms which never arrived, when we enquired about their wherabouts we were told they were on my plate. Hmm.. My mixed yakitori set also included mushrooms so I think they were pulling a fast one. Back on the streets of Shinjuku the rain was getting heavier and tiredness was setting in once again. The rain didn't seem to stop this group of protesters though. It was getting close to check in time so we headed back to the hotel and finally got some much needed sleep. 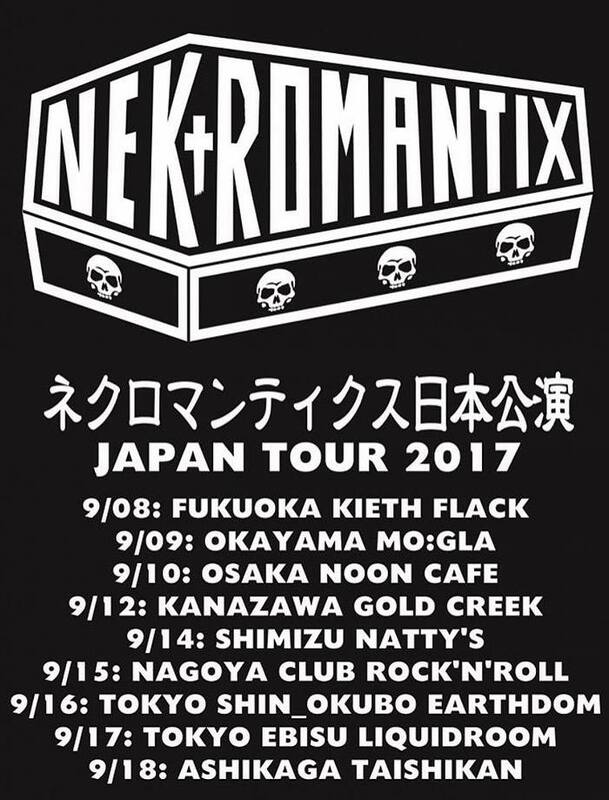 There was an all day event taking place at Liquidroom a few miles away in Ebisu and I really wanted to see Nekromantix. The problem was I had no idea what time they would be on stage, I'd made numerous enquiries but nobody seemed to know. We couldn't risk missing Nekromantix so after just 90 minutes sleep we were up and about again. It's amazing what a little sleep and a can of Red Bull can do in these situations. This onigiri was amazing, a fried rice ball with a rich creamy egg. We arrived at Liquidroom at 18.55, exactly ten minutes after Nekromantix had finished playing. Initially a huge disappointment but we decided to go in and catch the other bands anyway. The cost of getting in was ¥5000 (£33) and an additional charge of ¥500 (£3.40) which covered your first drink. Smoking was allowed in the bar area and since my last visit I'd noticed an increase in people vaping. The bar set up here was quite strange, the main bar charged double the price for drinks as the temporary bar set up opposite. The first band we caught were Cracks from Tokyo, their high energy set most definitely made up for missing Nekromantix. These guys were amazing and the crowd loved them, they played on a small stage at the back of the large venue. Within a couple of minutes of Cracks finishing the much larger main stage came alive with BiS. This Japanese idol group are also known as Brand-new idol Society, they were a far cry from what we'd being watching a few moments before. My wife and I watched in amazement as their fans armed with glow sticks mimicked many of their moves. It wasn't really our cup of tea at all but it was certainly an experience to see. The headlining band were The Rat Bones, they entertained the crowd with a quite bizarre mix of songs accompanied by dancers that went through a number of costume changes. We were pretty drunk by now and thoroughly enjoyed them, a great end to the night! After leaving the gig I was tempted by plastic food displays on the way back to the hotel. We decided 7-Eleven would be a better plan tonight though. At just ¥100 (70p) this corn dog was perfect after a few beers. My wife tried these really hot chilli crisps. These tofu wrapped rice snacks are really moist and taste so good. Having stuffed our faces it was finally time to get a good nights sleep before heading North in the morning to Hokkaido. When I see a fry up going for twelve quid and you know it probably cost them a few quid to knock it up, it didn't even look all that appetizing either.